Using an old bicycle, some string and a car battery, New Line Cinema has created a MacGyver movie. Well, it's started working on one at least. MacGyver is one of those shows that has shaped pop culture so much that its name has become a verb and it got a whole episode of Mythbusters all to itself. But it's been a while since the show wrapped up, so you could be forgiven if you're not familiar with it. All that's set to change, however, with the announcement of a MacGyver movie. New Line Cinema has hired Jason Richman, writer of Bad Company and Swing Vote, to write the script, but other details, like whether Richard Dean Anderson - probably better known now as Jack O'Neill of Stargate SG1 fame - will reprise his role, or if it will be a reboot of the franchise with someone younger. 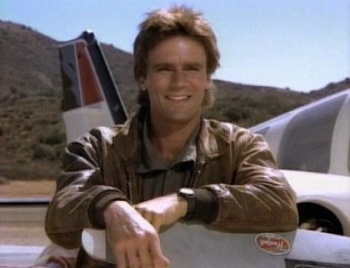 Personally, I'd rather see the "real" MacGyver, than some new guy, although the mullet can stay with the TV show.